Haswell Refresh to launch in May, Broadwell in Q3 - how does that make sense? What people do with Desktop PCs to really need faster than SATA-6 performance today ??? Boot? Open applications? Cache recently visited websites? Load assets in video games? There is nothing wrong with that connector. It's certainly a lot better than PATA + MOLEX. PCIe SSDs aren't really an option for those of us off in ITX land. Of course they are. Just get a board with an M.2 connector that supports PCIe signalling. Most of those are HDD performance(latency, seek etc) oriented than SATA bandwidth limited. The only bandwidth limited scenario i can see is transferring large data files from one SSD to another. But how many times do you do that with your desktop PC ?? "HDD performance"? Of course we're talking about SSDs here, not HDDs! PCI-E should be lower latency. There's a real lack of information out there, though. So has it been confirmed that current Haswell Z87 boards will or will not support Broadwell on the desktop? Was planning on building a Z87 mATX setup that I'd like to be able to pop a Broadwell into in a few years when Broadwell's are cheap. If I have to wait for new Haswell Refresh boards that will support Broadwell that's fine, I can wait. Launch VM-Ware images with persisted 8+ GB of RAM VMs. All I want is a high-end 14nm CPU at that point. Why do you want 14 nm for Desktop? What improvements do you expect it to bring compared to Haswell? The lower TDP does not matter much for desktop. Nothing life-changing.It's as I said,I could go midrange on my CPU now (Don't really need HT now,but it would be nice to have) so that I don't cheap out on other things,and move to a high-end chip in the future.It just seems kinda stupid to go from a 4670k to a 4770k at that point,so I'd want something newer.The potential improvements of the new node plus whatever else Intel manages to put in there would be nice,albiet probably useless.Also,I'm curious to see how these things will overclock,although if the transition from 32nm to 22nm is anything to go by,I'm not that optimistic about it to be honest. I will want an upgrade at some point in the not very distant future.It's in my nature,even if I'm completely satisfied with what I have.It's not so much about the potential improvements,but rather about the thrill of having something new. The cheaper, smaller transistors more than offset the increased wafer cost. Eventually yes... but not in time for a full Broadwell launch. By sticking to the higher margin parts, there's a little wiggle room to increase prices if needed. The fab equipment must be super expensive, esp when you see Intel shut down those two 14 nm fabs they were going to use. Non-Volatile Memory Express is specifically made for SSDs and uses the pcie interface. 3GB/s sequential and 740K random IOPS. At the same TDP, Broadwell should have a clock speed bump. Intel may choose instead to lower the TDP, but if they don't, 200-300 more MHz isn't unlikely. It should also overclock higher than Haswell. I'm not expecting it to be the next Penryn or anything, but it should be better than Ivy Bridge. Enthusiasts won't have to deal with the regression from solder and planar FEts to paste and FinFETs, so the clock scaling won't be held back. I'm keeping my hopes pretty conservative, though. What I'd like to see and what I expect to see is a return to that magical 5GHz mark that Sandy hit with a good chip, barring unforeseen issues. Although I'm not counting on it, a 5% IPC bump would actually mean that Broadwell would end up being over 20% faster than Sandy Bridge when overclocked, if it can compete in max-air clocks like I'm predicting. 20% isn't bad at all in this day and age. Skylake brings more potential for more performance, but it also has more potential to deliver things enthusiasts don't enjoy... wish we knew more about it. I still expect Broadwell-K's CPU to overclock worse than Haswell due to the heat density and low clocks optimization, but we will have to wait and see on that one. iGPU should overclock very nicely though, kind of interested to see how high people can get it. - Sell it at 65W (same as the R models). Kind of lazy, but could they get it to 3.5 base? Maybe. That would be a nice improvement at that TDP, but it would lose to HR-K, and given that I am also expecting them to charge more would not go over too well. - Sell it at 77W (same as Ivy-K). Same clocks as HR-K: 3.6/4. People will complain about how it's not any faster than HR-K given the 0% IPC improvement but at least it wouldn't be slower. Maybe they could get it to 3.7/4 or play with the turbo bins so it is clearly faster. - Sell it at 95W (4 Ghz no turbo) and watch people complain when they can't overclock it much/at all? I don't know about that one. Has-what? How about SB or even Nehalem? What practical gain can desktop Broadwell bring for 99% of people with SB? ~20% improved performance, +/- 5%. See my post above. I'm not so concerned. 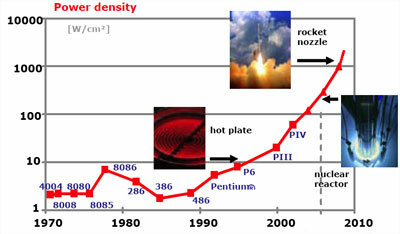 Heat density was never cited as an issue until 22nm, where it was erroneously cited as the problem behind Ivy Bridge's overclocking troubles. IVB didn't clock as high as SNB primarily due to two issues: TIM instead of solder, and regressed performance at the voltage levels used in overclocking on air and so on. The latter isn't well known, and Intel certainly wasn't going to advertise it. The vast majority of tech journalists and enthusiasts aren't aware of that regression. So 22nm's overclocking issues had nothing, if anything do with heat density. If it becomes an issue on 14nm, fine, but there's no real precedent. The problem with Intel is that +20% in reality is useless for 99.9% of people. This forum sometimes forget people don't buy CPUs to run Superpi all day long. But we do other things that webpages and youtube. Even my change from a 3570 to a 4670 was significant in CPU limited games like Civ V, Rome 2 etc. Since it lowered the turn time. and regressed performance at the voltage levels used in overclocking on air and so on. The latter isn't well known, and Intel certainly wasn't going to advertise it. The vast majority of tech journalists and enthusiasts aren't aware of that regression. It seems like the heat density doesn't really become an issue until you hit a certain level. I'm thinking about that slide that Intel had about the Pentium 4 hitting 'Rocket Nozzle' levels, which may have prevented them from hitting the clock speeds they had hoped with it. The finfets look like they increased the density while increasing the heat rather significantly which is just accelerating the issue. Hopefully a 14nm GT3 die will be small enough that they will be able to fit it with an eDRAM die into an LGA socket.